The splendor of a big city can be seen in its tall buildings, art museums, entertainment complexes and shopping destinations. 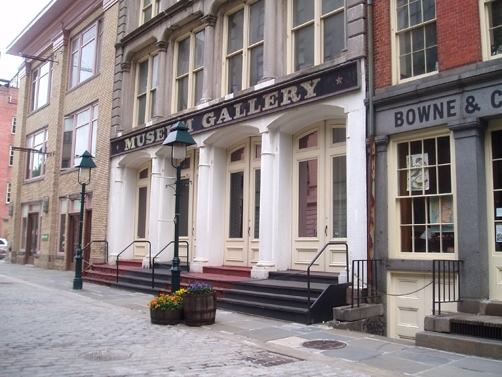 The charm of a big city can be seen in its older, historic districts. A short stroll from the downtown business center is Portland's Chinatown, Old Town and Saturday Market. The splendor of a big city can be seen in its tall buildings, art museums, entertainment complexes and shopping destinations. The charm of a big city can be seen in its older, historic districts. A short stroll from the downtown business center is Portland’s Chinatown, Old Town and Saturday Market. Start your visit of vintage Portland at an attraction loved by both tourists and locals. Portland Saturday Market sports a new look. Once located under the west end of the Burnside Bridge, the Market now extends to Tom McCall Waterfront Park and is open Saturdays and Sundays from March until late December. Arts, crafts and food are available for sale at the open-air market, which you can enter at First and Ankeny. Enjoy the wide selection of vendors, including Circles of Steel, where you’ll find expertly crafted steel mosquitoes, dragon flies and lady bugs. The Spoiled Cat has an assortment of gourmet catnip toys. Drop by Doodlebug Duds and purchase handcrafted pet products. Metalart by Swan specializes in life-size stainless steel metal sculptures, including the winged heron and brown pelican. The true beauty of the Market can be found in its proximity to the Willamette River. As you cross Naito Parkway, glance to your left and see the iconic “Made in Oregon” sign. After a bit more shopping, walk up a few steps and discover the scenic Willamette. Stop for a moment and watch the river traffic. On the east side of town, you’ll see the Rose Garden, home of the NBA Trail Blazers and the twin spire towers of the Oregon Convention Center. A short stroll from Saturday Market is Chinatown. Begin your journey at the Chinatown Gateway at NW Fourth and Burnside Streets. This colorful, opulent structure features a pair of lions and 78 dragons. Bring a camera and escape daily stress by visiting the Portland Classical Chinese Garden at Third and Everett. The beauty of China can be seen in the Courtyard of Tranquility and the Tower of Cosmic Reflections, which features a teahouse, operated by the Tao of Tea. Enjoy green teas, steamed dumplings, pickled bamboo shoots and music at the teahouse. On your way out, stop by the Chinese Garden gift shop filled with interesting souvenirs, hand-painted folk art and jewelry. You’ll find a great mix of gift shops and restaurants in Chinatown. Dragon Art Gift Shop, at Third and Everett, offers clay incense burners, fortune cookie purses, clothing and Xiang embroidery. Across Everett Street is Great Era Oriental Imports, where you’ll find colorful chopsticks, wall scrolls, dragon fans and painted tea pots and cups. If all this shopping reignites your hunger, visit the Golden Horse Seafood Restaurant. The six dollar lunch special includes the soup of the day, egg roll, BBQ pork and fried rice. As you exit the Chinatown Gateway, you’re only a short walking distance to the historic Old Town district. At Ankeny Plaza, observe the charming Skidmore Fountain, the oldest piece of public art in Portland, which debuted in 1888. A few steps from the fountain, read about Captain Alexander P. Ankeny (1813-1891), who built many brick and cast iron buildings in the area, including the Ankeny Block. On Second Avenue, The Monkey and the Rat is a splendid shop featuring “fine & friendly objects from faraway places.” Shop for teakwood furniture, hemp dragons, traditional Thai cushions, silk textiles and Thai silver jewelry. If you’re in need of a quick sugary boost, visit the funky Voodoo Doughnut. This Third Avenue favorite, located in a space roughly the size of a large closet, offers a rapidly changing menu. Some recent offerings have included the McMinnville Crème and the Voodoo Bubble doughnut. Voodoo also offers wedding ceremonies, performed by ordained ministers. After you get hitched, consider taking lessons in Swahili….yet another service by Voodoo that has attracted national attention. For a modest donation, visit the Oregon Nikkei Legacy Center for an introduction to the early history and culture of the city’s Japanese American community. Located on NW Second, explore Executive Order 9066, issued by President Roosevelt following the Japanese attack on Pearl Harbor. The decision forced the internment of over 110 thousand people of Japanese descent. Several photos depict Portland’s assembly center. As you enter the museum, observe the replica of Japan Town in 1940. Wrap up your perfect day at Old Town Pizza on Davis Street; just a short hop from Naito Parkway. Order the “House Special” pizza. If you only have time for a snack, try the scrumptious garlic knots. Made with pizza dough, these treats are sprinkled with garlic salt and served with either olive oil or marinara. Easily reached by MAX light rail, Chinatown, Old Town and Saturday Market offer a splendid shopping and dining experience. It’s also a nifty way to learn about Portland’s early history. Summer is the best time to visit Portland. The weather is great, the cafes open their outdoor seating areas and your chance of running out of things to do is virtually zero. You can also visit during the not-quite-summer months of June and September to take advantage of slightly lower hotel rates and thinner crowds. If you’re traveling on a budget or want to steer clear of your fellow tourists, just pack an umbrella and head to Portland during the winter off-season. If you enjoyed this article about Portland’s Chinatown, Old Town and Saturday Market you’ll also love Portland’s Best Spots for Brunch. How to get there: You can travel to Portland by car, plane or train. The most beautiful way to travel to Portland is on Amtrak’s Coast Starlight which operates daily from Los Angeles, San Francisco, Portland and Seattle. If you decide to fly, you’ll be traveling to Portland International Airport (PDX). Find cheap flights Check Trip Advisor for the best flight to Portland. Where to stay: There are many places to stay in Portland as well as in Oregon. There is a wide range of hotels, from budget to luxury. For a luxury hotel that won’t break the bank, I recommend the Hampton Inn & Suites Portland-Pearl District which is currently the #1 hotel on Tripadvisor. For a mid-level hotel, I suggest the Kimpton Hotel Monaco Portland, Finally, for a budget hotel, try the Econo Lodge Portland Airport. You can also check HotelsCombined for the best Portland Hotel Rates. Hotels in Portland: Check Trip Advisor reviews for Hampton Inn & Suites Portland-Pearl District or Kimpton Hotel Monaco Portland. What to pack: The temperatures each season vary greatly. I visited in July and was very happy to have a Jeans, tank top and sunglasses. for the beautiful summer days in Portland. If you are visiting in Winter, you’ll want to bring heavy-duty layers and scarfs. While the summer months can be gorgeous, rain is an option year-round in the Pacific Northwest, so packing a hoodie, rain jacket or umbrella is a must! Bring a good quality mirrorless camera for getting those beautiful Portland landscape shots. I use the Sony Alpha a6000 . A great cross body travel bag . Crossbody bags prevent theft and are much easier to access. A Pair of sneakers or good walking shoe is a must Here is a great option for women, and here is a great shoe option for men for walking around town or exploring any of the nearby hiking trails. Scott Keith is a freelance writer in Portland, Oregon. Scott enjoys writing on many subjects, but hopes to focus on travel and health. Visit Scott at www.scottkeith.wordpress.com and www.itsaguythingblog.wordpress.com. E-mail Scott at scottbkeith@yahoo.com.